It's Q&A Tuesday! Every Tuesday I'll answer a different question about anything related to life skills, personal development, goal setting, etc... If you have a question, you can submit it by clicking on the "Submit a Question" button above and filling out the form. Simple. Let's move on to this week's question. "I'm not unhappy necessarily, but I'm ready for something different. The problem is that there are so many things I want to change. Where should I get started?" The first thing you need to do is prioritize. You could go about it a few different ways, but however you do it, the first step is to list everything you want to change. Just grab a piece of paper and list everything you want to do or be. If you'd like, you can revisit the list a couple of times to make sure you haven't forgotten anything important. Once your list is complete, go through it and circle anything that is important and would have major consequences if not taken care of soon. These items will go in your "emergency" list. So, if you're a jerk to your wife and she's shopping around for a good divorce attorney, changing that behavior would definitely be considered an emergency. Biting your nails less, on the other hand, probably wouldn't be an emergency. 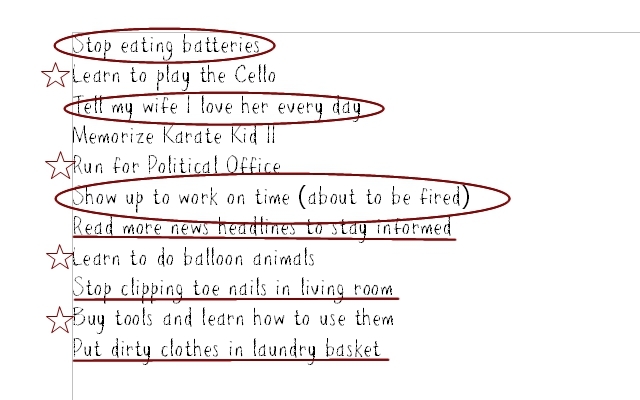 Next, put a star next to everything on the list that you're most excited about and underline anything that will be relatively quick and easy to accomplish. The starred items will make up your "motivation" list and underlined items will go on your "quick win" list. This is where you start. These items need attention now, so get on it and power through them so you can get on to other things. Talk to friends, family, a life coach, a therapist etc... to start setting and reaching some goals. You don't have to reach perfection before moving on, but you at least need to remove the emergency out of the equation. These are the things you really want to change. You want to be the kind of person who spends more time outdoors, has more friends, serves more in the community, and has people over for dinner parties. 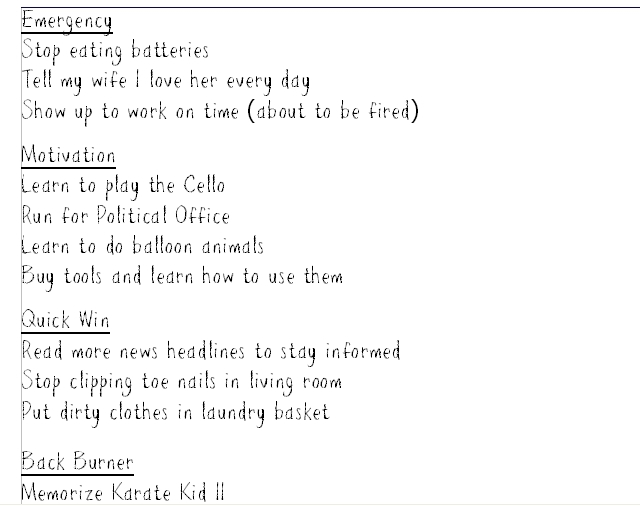 These will probably be positive action goals. Think forming GOOD habits rather than just stopping BAD ones. You may get hung up in the process and feel like you've bitten off more that you can chew. At any point you can pause your other goals to work on an item from your quick win list. These are small and simple things like eating an apple a day, saying good morning to everyone at work, or trying a new hairstyle. You can check them off the list quickly and easily to get your momentum back. Don't forget about these goals, but for now they can just simmer for a little while. After you've gone through the more important and exciting changes you can come back and set some new priorities. If this is all just way too complicated for your style, I'll give you a simpler answer. Think of the change that is the most important for you to take care of and do that one first. Then think of the next most important thing and do that one. Repeat until you've done everything you could ever want to do. :) Good luck! I really sat down and gave this an honest try. It changed my outlook on my whole week. I was able to find time to work on a large project and finish. I blame the organization and simplicity of the list.This was a great idea! Thanks!